Scala is a programming language for the Java virtual machine, providing excellent support for both object-oriented and functional programming. By including a powerful actor framework in its standard library, Scala offers a compelling approach to tackle concurrent programming. Scala’s actors let you apply the actor concurrency model to the JVM, enabling real-world solutions that are efficient, scalable, and robust. 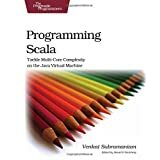 Published by Artima, this is the first book on Scala’s actors, co-authored by the creator and lead maintainer, Philipp Haller, and Frank Sommers. Starting with the fundamentals of the actor concurrency model, this book offers a comprehensive tutorial on practical programming with actors in Scala. It enables you to leverage the full power of today’s and tomorrow’s multi-core processors by describing both basic and advanced features of Scala’s actor framework in-depth.